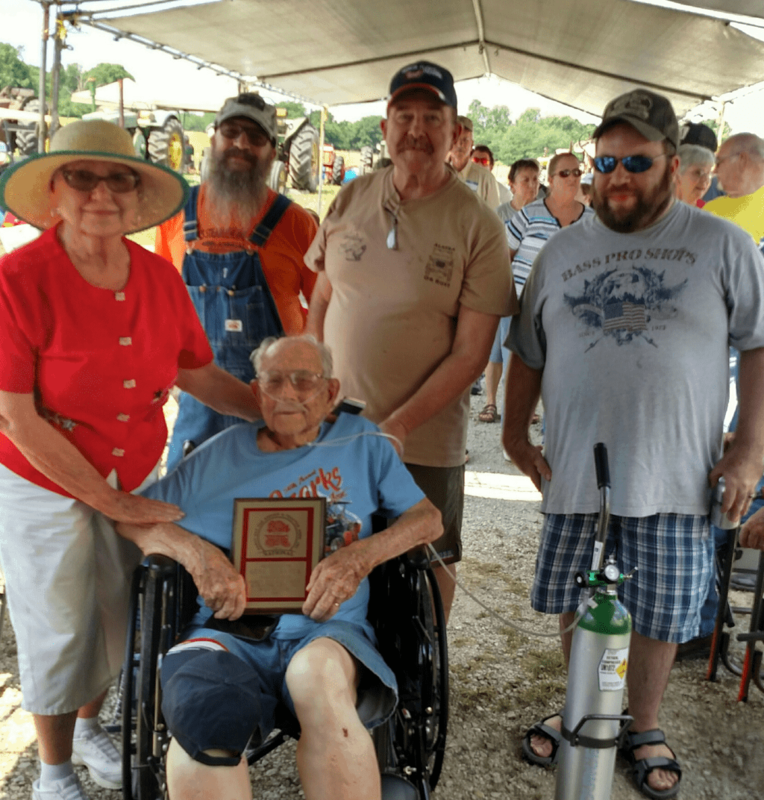 Gene Dilsaver was inducted into the National Early Day Gas Engine and Tractor Association “Hall of Fame” after a short ceremony held and the Voris 17th annual Tractor show May 28, 2018 at 11:30 AM. Meeting was called to order by Larry Voris and Charley Stark (both Hall of Fame Members from Branch 16) and the presentation was made by National director Robert Craig. Gene was recognized for his many years of service to the Association. Gene was accompanied by his 2 sons John and Dale Dilsaver and wives, Grandson Josh Dilsaver and wife and his sister Beverly Nichols. There were approx. 250 in attendance for the event. Gene Dilsaver was Sec’y-Treas of the Southwest Missouri Early Day Gas Engine and Tractor Association, Branch 16 from 1993 to 1996. He regularly attends monthly branch meetings and participated in club work days. This includes mowing the grass at the club show grounds. In looking back through the club history you find Gene’s name involved in about everything that happened since he became a member November 3, 1979 and still is. Gene has been a member of the Southwest Missouri Early Day Gas Engine and Tractor Association Branch 16 since 11-3-1979. He has inspired four generations of his family to be involved in the club. Gene was a director 1990-1992 and again 2006-2008. Gene attended several National Shows starting back in 1980’s. Even though he is currently in his 90s, he still regularly attends monthly branch meetings, still participates in club work days, including mowing the grass at the club show grounds (even in the heat of the summer). Gene promotes EDGETA by attending EDGETA sponsored shows including the Springfield Green County Library district’s program and the Ozark Empire State Fair when able. Gene has inspired three, now working on four, generations to get involved in EDGETA. When his youngest son was a new father, Gene provided him with his first hit-n=miss gas engine. As a result, two (going on three) additional generations have come to love both the sport and EDGETA. Gene has made it possible for his son, daughter – in – law and grandchildren to attend national shows and meetings. Including helping his grandson attend an executive meeting as an officer. 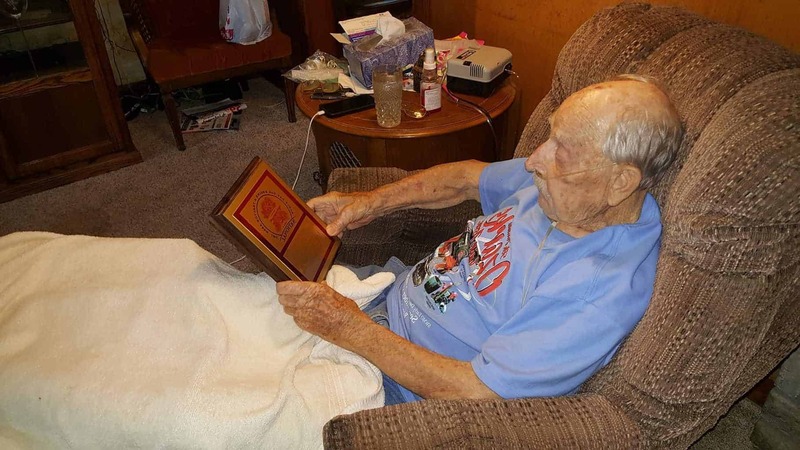 Gene’s devotion to EDGETA has inspired his son to serve as an officer and volunteer along with inspiring his grandson, who has been the web designer for both the local branch and the National EDGETA site for several years. Gene displays working Barker Rim saws. We have been attending shows with Gene since the early 1980s, I do not remember seeing anyone else demonstrate a working Barker Rim saw except Gene. He is from Ava where these saws were first manufactured and one of his saws was bought new, so Gene has a great amount of knowledge about these machines. If you are at a show and are close to Gene’s display when he demonstrates one of his saws, people start walking towards him from all directions. For his family, this is quite a site to see. Gene has taken his display to schools, library programs and the local fairgrounds to promote the preservation and exhibition of antique equipment. These shows along with his knowledge, experience and ability to share his knowledge in an interesting way, educates the public about these wonderful pieces of history. I’d like to speak towards his contribution to E.D.G.E.T.A. I think Grandpa Gene contributes in a number of ways that are a bit hard to quantify. First I think grandpa’s fantastic since of “Missourian showmanship” helps attract crowds and inspires lots of word of mouth advertising. Grandpa is too humble of a man to boast about it, but his camp is always one of the most memorable and exciting on the grounds every year. Any time I talk to someone about the show, it goes one of two ways, if they’ve been, I’ll ask them if they remember the gentleman who demoed that odd loud saw, most folks remember him and always say how exciting, neat, interesting or etc. that was. If they haven’t been there, I’ll pull up the video of him demonstrating it, which is the first result on Google for a handful of terms, and after they watch the video they always want to know more. Grandpa doesn’t brag about it, but he always puts on a show that draws a crowd. Second, I would like to speak towards how he inspires others to do their part. Grandpa is a diligent and devoted member of the organization. He doesn’t aspire to any higher positions or want any control in the organization, he just wants to learn a hand to help anywhere he can and for anyone he can. This kind of selfless behavior has inspired plenty of others to give what they can in the same way. This selfless giving has allowed the club to grow in ways it couldn’t have without Gene, his son’s professional plumbing and roofing skills and his grandson’s web development skills are just a few examples from my limited perspective. I think between his showmanship, his inspiring four generations of members, and his selfless service to the branch of the organization he loves, along with the impact branch 16 has had on the national scale, grandpa Gene should definitely be added to the EDGE&TA hall of fame. Gene & Ellen Dilsaver were married 1-11-1957. They enjoyed 59 years of marriage until her death in 2016. They have two sons, two grandsons and one great-granddaughter.